Poorly known. A Nearctic species was reared from homopteran nymphs (Achilidae) feeding on subcortical fungi. Females have been collected in ant nests and small mammal burrows. About twenty species in 2 genera. Ashmead, W.H. 1893. Monography of the North American Proctotrypidae. Bulletin of the United States National Museum 45, 1-472. Olmi, M. 1996. A revision of the world Embolemidae (Hymenoptera Chrysidoidea). Frustula entomologica (1995), N.S., 18: 85-146. Olmi, M. 1999. 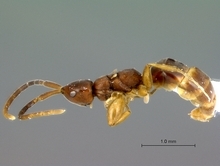 Description of two new species of Ampulicomorpha (Hymenoptera Embolemidae). Bollettino di Zoologia Agraria e di Bachicoltura 31 (1): 1-10. Olmi, M. 2004. New species of Dryinidae and Embolemidae from Madagascar (Hymenoptera Chrysidoidea). Frustula entomologica (2002), N.S., 25: 86-109.